The growing use of U.S. and multilateral economic sanctions--and the increasing and controversial attention such measures are attracting internationally--create a need for a detailed legal analysis of the subject and its policy implications for both U.S. practitioners and their counterparts in other countries. The expanding field of sanctions is especially worthy of close scrutiny as it generates significant (and often inadvertent) influence on finance and trade. Increasingly, lawyers and business people involved in international transactions must take account of the risks, both actual and potential, inherent in compliance with economic sanctions on trading partners. 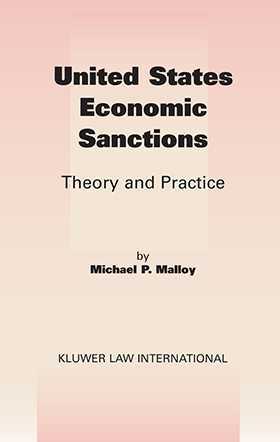 This major new work, a completely revised successor edition to the author's much-cited Economic Sanctions and U.S. Trade, shifts the main emphasis from the mechanics of applying foreign policy objectives to a careful and complete articulation of what those goals are or ought to be--an approach that leads inevitably to a concrete methodology for assessing the effectiveness of sanctions. the marked increase in multilateral sanctions programs in which the U.S. is a participant. In-depth analysis of major U.S. sanctions programs (those imposed on Cuba, Libya, and Iraq, as well as several other lesser programs) presents numerous hypothetical but realistic international scenarios, demonstrating their working-out under the practical application of specific elements of each sanctions program.